After 4 bumpy rides on the package film track I am delighted to tell you my friends that the last 2, which I watched today, are delightful. 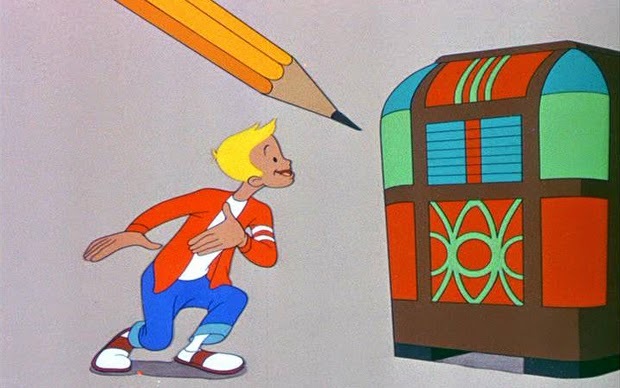 Melody Time is the last of the package films with more than 2 stories and it might as well have been called Make Mine Music 2 but it is not as odd as it’s predecessor and the quality of animation and writing is significantly better. This does not feel like the scrap heap projects that MMM did. 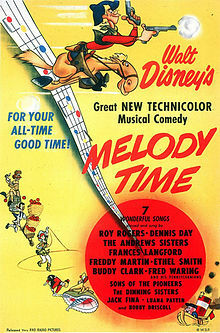 Melody Time was released in 1948. 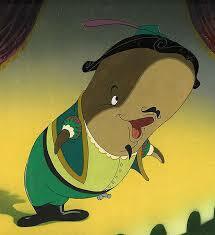 Like MMM it is stories put to modern music like Fantasia had been classical music. The war was over by that point and Disney was hard at work on their triumphant return to fairy tale stories in 1950 with Cinderella. In the meantime we get Melody Time and Ichabod and Mr Toad. Eventually all is saved and we are back to our Christmas song which I liked. A very strong segment about a bee confronting the music of the Flight of the Bumble Bee. You see a Dali influence in this one for sure. If you aren’t Christian I don’t know if you’d enjoy this as much as some of the rest of us that are. The music is a nice spiritual song called The Lord is Good to Me. In a world where Christianity is basically abhorred by the media and kept out of anything mainstream it is nice to hear a little shout out on a Disney film. 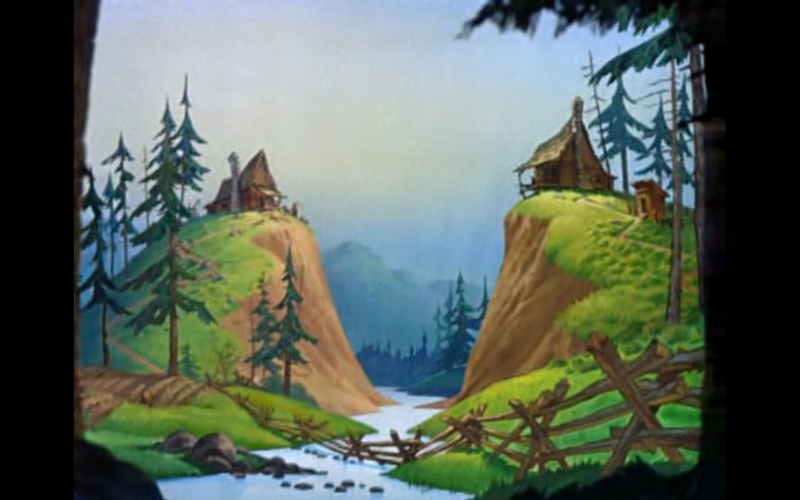 The artistry in Johnny Appleseed reminds me a lot of Grandma Moses folk art. 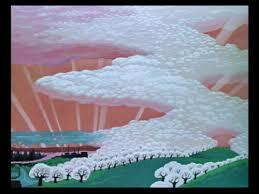 With the clouds merging with the apple trees it is beautiful. This isn’t breaking huge new ground but it is very sincere and sweet and I liked it. Johnny is inspired to spread happiness around the world in the form of apple trees where ever he goes. It does drag in a few sections but overall I enjoyed it. The kind of short you could play in Sunday School. Nothing wrong with that! This is very similar to the Pedro story from Saludos Amigos. Basically the little tug boat is treated poorly. Then his size saves the day- another Rudolph story. It’s sweet and clips along so I didn’t mind it. Our Dali friend is out again. The story of a tree told with a surrealist touch. Actually it’s not even a story. It’s just a piece about the majesty of a tree and an oddly shaped one at that. Kind of a surrealist tree. The only thing I didn’t like in this piece is that all of the sudden the tree is the cross which seemed to come out of nowhere. That caught me off guard because nothing in the piece really spoke to religion and there it was. This feels like an extra from The Three Cabelleros. 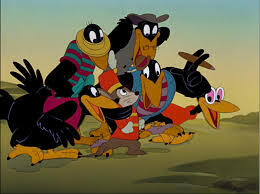 We get our troupe back including Jose, Donald and Panchito. We also get a latin singer similar to Aurora Miranda but I don’t think it is her. They dance, they sing and it is all very tame but enjoyable. Nice to see Jose for the last time. A very sweet story. Pecos has been raised by coyotes in the wild. Eventually he cleans up and falls in love. Unfortunately for Bill his love wants to wear a bustle at their wedding and it becomes a bustle trampoline (you will have to trust me on that). In the end we find out why coyotes are crying to the moon. There’s no happy ending which for Disney is a big step. I enjoyed it. 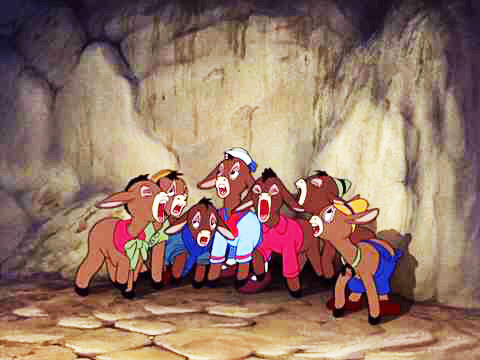 Pecos sings one song about the west and how the colors of the Native Americans made the rocks red, orange, gold and even purple. Some could find that a little bit racist but it isn’t so bad. I really liked Melody Time. It is much better than Make Mine Music which was entertaining in a so bad it’s good way but Melody Time I genuinely like. It is appropriate for all ages. Each set is around 8 minutes and it is narrated by Roy Rogers and his wranglers (we meet them in a live action scene). The music is uniformly good and the colors and artistry looks like real effort went into them not an afterthought. 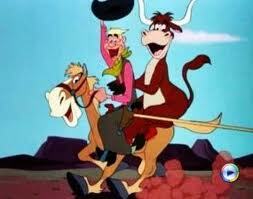 There is also a pretty good variety; although I think the Pecos Bill story goes on a little bit too long. Still, it’s sweet and well done so I enjoyed it. 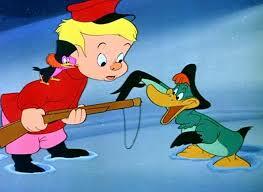 So, I’m afraid I’m going to be tougher on Fun and Fancy Free, Ichabod and Mr Toad and Melody Time. I can tell you one thing I have never looked forward to watching Cinderella more in my life. But today we are talking about Fun and Fancy Free. 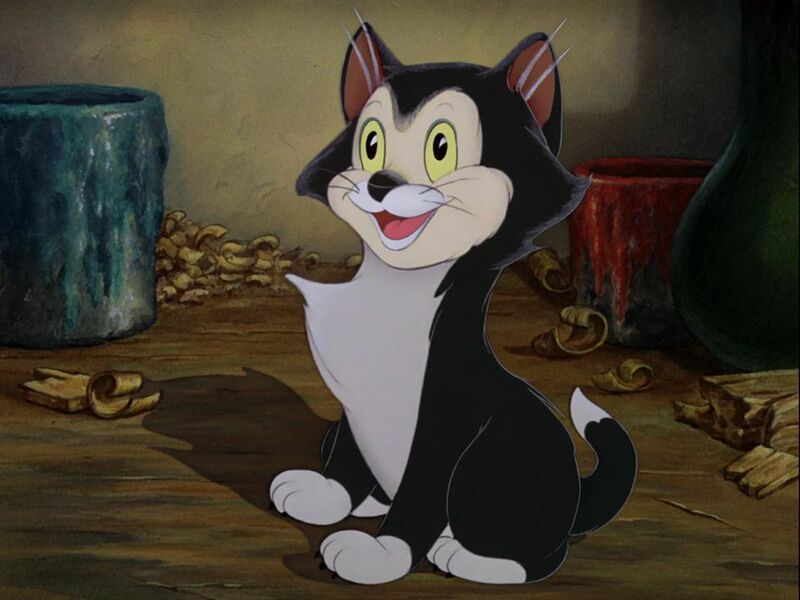 I don’t know if it is better or worse than the other package films or I’m just getting tired of them but certainly it is very thin gruel and in a way Make Mine Music took more chances so was more entertaining. First of all, the name Fun and Fancy Free is a misnomer because there is nothing fancy or free. Fun is a toss up. 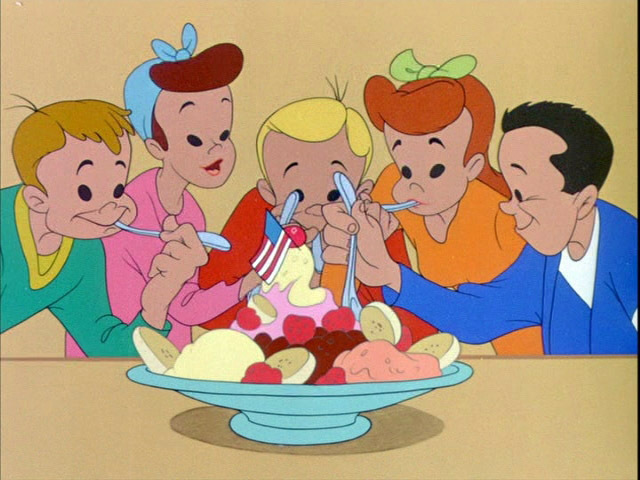 It consists of two longer animated stories with Jiminy Cricket narrating and then it changes to a party with Edgar Bergen, Charlie McCarthy and kids. 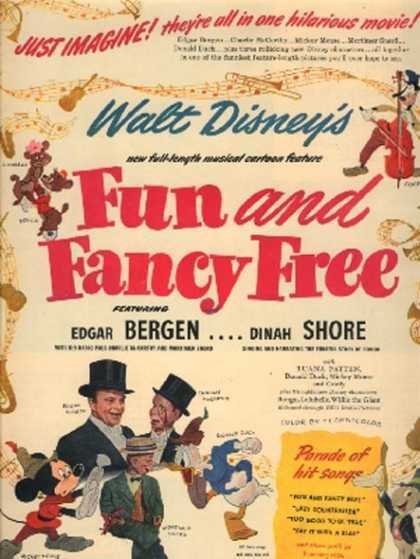 Released in 1947 Fun and Fancy Free was an attempt by Disney to keep the studio afloat after being basically co-opted by the US Government for propaganda films. However, as I will show later other studios are still producing good animation at this time period so I am less forgiving of that excuse. Bongo is a circus bear that yearns to live in nature outside of his circus cage. 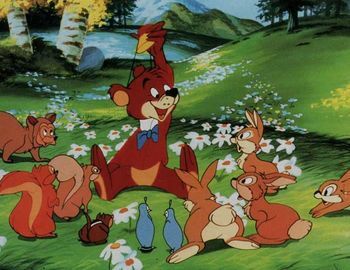 Eventually he breaks free and struggles with the forest where all the bears are three times bigger than Bongo except for one girl he immeditely falls in love with. Disney at this point is big on the instant love but that is so boring. Even for an animated short it is boring. Then Jiminy gets invited to a birthday party. 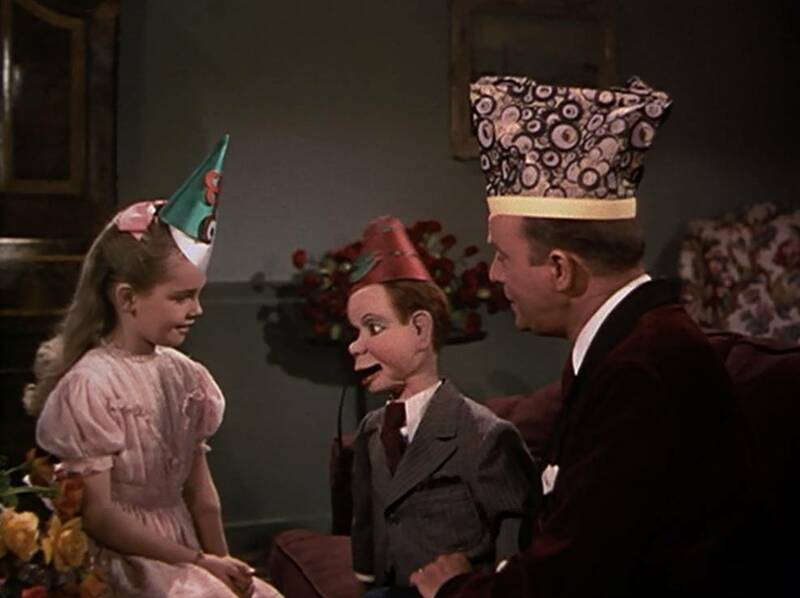 And at this party is a little girl, Edgar Bergen and Charlie McCarthy (and other puppets). I know that Bergen is practically the father of ventriloquism and a comedic genius in the minds of many. However, I don’t think this particular movie is a good showcase of that ability. I hate to say it but I could see his lips moving every time the puppets spoke. Sometimes very visibly making the words with his mouth. I wish I could find a clip to show you. Like I said, I’m sure he is brilliant but just not in this movie. It ends up coming off as kind of strange bordering on creepy. In this piece we tell the story of Jack and the Beanstalk but with Mickey as Jack. Mickey is living as a farmer in Happy Valley. They are happy and everything is growing because of a magic harp that plays peaceful music. The harp is stolen and then the town turns to ruin. 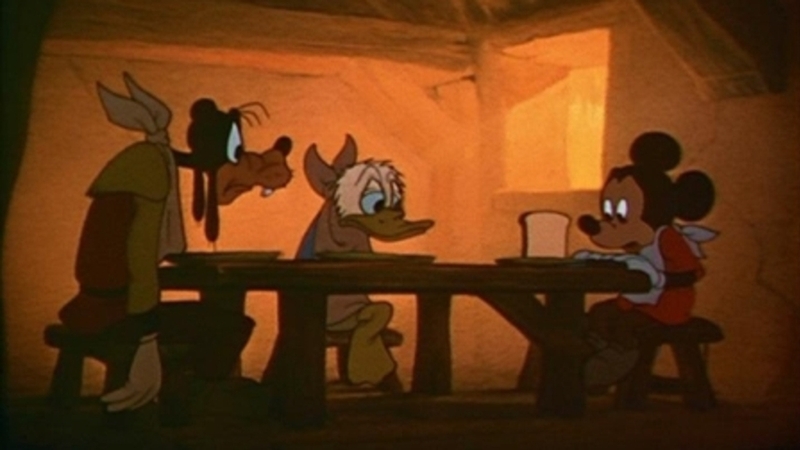 This leaves Mickey, Goofy and Donald with basically no food. The situation is bleak and low. 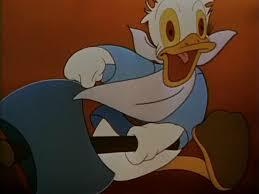 The starvation makes Donald have crazy eyes and do strange things with a hatchet. Then Mickey goes and trades the last cow for magic beans which of course become our beanstalk leading the giant who in this film is a big duffas. 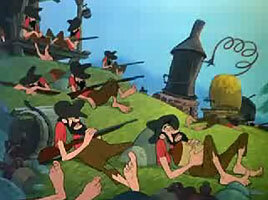 Mickey and the gang find the harp and need to take it from the giant which they do relatively easily. And seriously it all resolves in like 5 minutes. 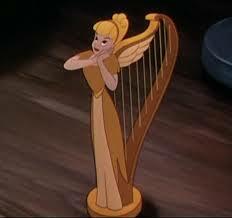 The harp is rescued and Happy Valley is back to it’s happy self. Mickey and the Beanstalk is fine but not especially memorable. Aside from the giant having magic there is no attempt to make it different and even those powers aren’t really used in an interesting way. If there ever was a phoned in fairy tale this was it. The only thing that makes it of real note is it is the last time Mickey is voiced by Walt Disney. To see a much funnier and original version of Jack and the Beanstalk watch the Looney Tunes Jack Wabbit and the Beanstalk. I think most people would agree Looney Tunes for the win. It’s funnier. It’s shorter. It’s stranger. The iconic characters get more to do. It’s just more creative and interesting. So, that’s it for Fun, Fancy Free. 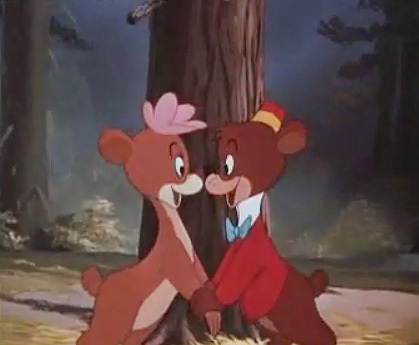 A bear that learns to slap women to show love (great message for kids…) and a 40 minute fairy tale bit that Warner Brothers did better in 7 minutes. I hate to say it but this is my least favorite Disney so far. It’s not creative, funny, beautiful or unique. Bland, bland, bland and the live action sections don’t work and are awkward. In some cases that produced hidden gems. In others boring segments that should have been kept in the scrap pile, but in many more cases it creates things truly bizarre, which never would have been produced in any other circumstances. I kind of like bizarre so 2 out of 3 of those outcomes works great for me! 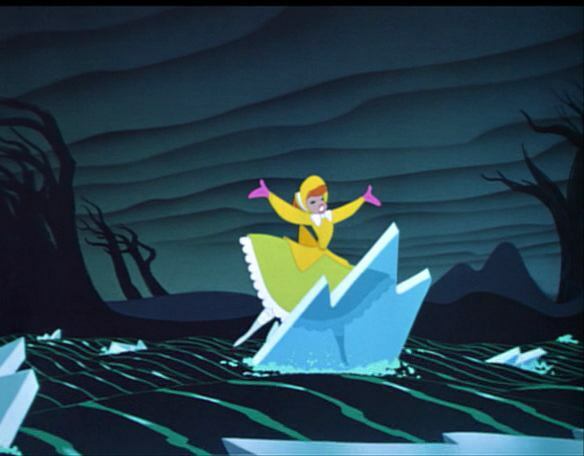 So we get Make Mine Music. This is sold as a Fantasia with popular music of the 40’s. Released in 1946 some of the music feels dated which is something that will happen with popular music of any era but not as much with classical. A great symphony in 2014 will probably sound a lot like a great symphony in 1946. 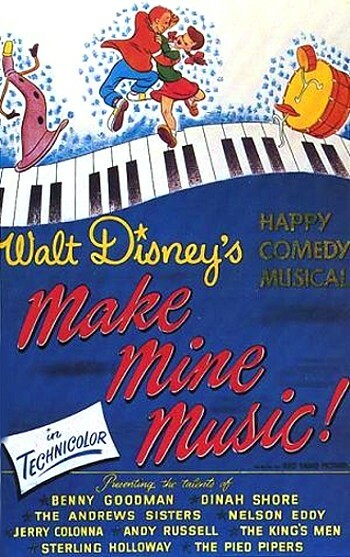 Make Mine Music has 10 sets and like I said- some work, some don’t and some are just strange. Let’s dive in. This was actually not part of my DVD. It was removed because people felt it was too violent and I can see why. It is a take on the Hatfield and McCoy feud (which do children even know about that? I didn’t until the miniseries last year…) and has a bluesgrass soundtrack accompanying it. Basically you have 2 families who hate each other because one stole some chicken eggs. So they fight. And everyone dies…(Great message for kids!) but one from each family, Alice and Henry. They actually show the ghosts around the mountain. Ok. I can see why they took that off the DVD. I can’t say it isn’t entertaining. This one is interesting because it was filmed originally with Clair de Lune for Fantasia but here it is with the Ken Darby Chorus and has a bayou poem that I couldn’t understand without the closed captions. Compare these I think you will agree the Clair de Lune is much better. This is another strange one. It has Benny Goodman and his orchestra and is supposed to portray youth in the 40s. Everything looks like Archie and Veronica from the comics which was popular then so it very well could have been the influence. As the music goes the pencil draws the teens. 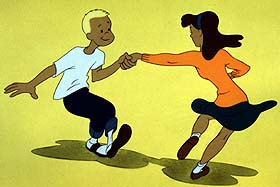 There’s a surprising mixture of kids like you see a black couple dancing. I would say this one is mildly entertaining to strange. I love big band and jazz music but for some reason most of the arrangements in this film just seem kind of boring. There must have been an artist at the studio that loved Dali because every once in a while you see his influence creep in but not enough to figure it was a huge influence on the studio. 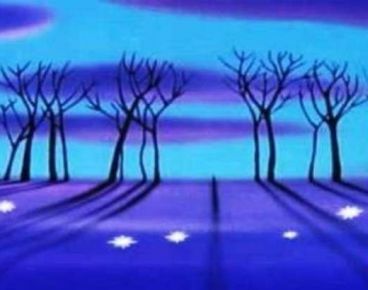 The elephants in Dumbo, surrealist touches in Fantasia and all the clips moments have something but this is literally bright pink trees and then the scene melts away. To me that just screams Dali but not in an interesting compelling way. 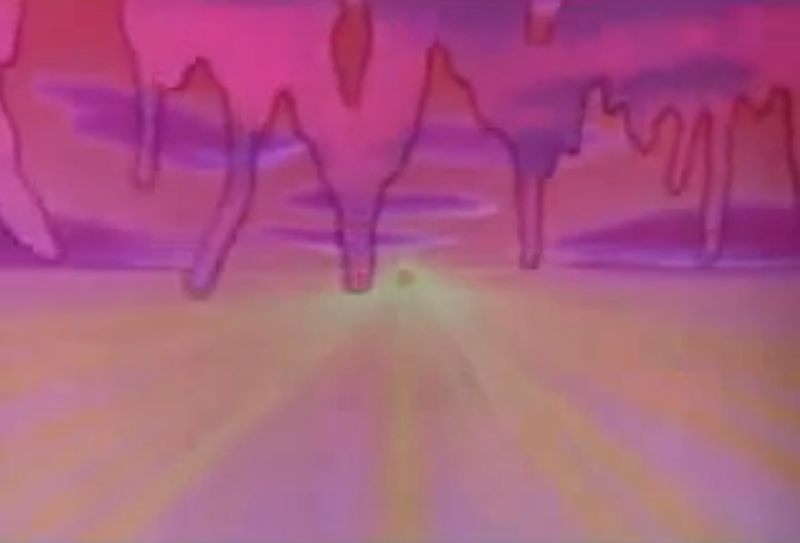 I like Dali fine but this episode is kind of forgettable. This is another strange choice. First of all, the music is minimal but I remember it completely differently than it is . I thought Casey was a sympathetic guy. Turns out he is actually a pompous jerk. You are glad when he strikes out but the artists act like we should feel sad and that the whole town is sad. It’s a very strange message. This is a simple short that has real live action ballet dancers as silhouettes with images and music. It’s not terrible but kind of blah. I think in an age when we didn’t have a million opportunities to watch dancing everyday on TV this must have felt more special. Probably the most memorable episode from this movie. As written by Sergei Prokofiev each animal in the story has a different instrument so the symphony gets to literally tell a story as it plays. It is an enjoyable set. 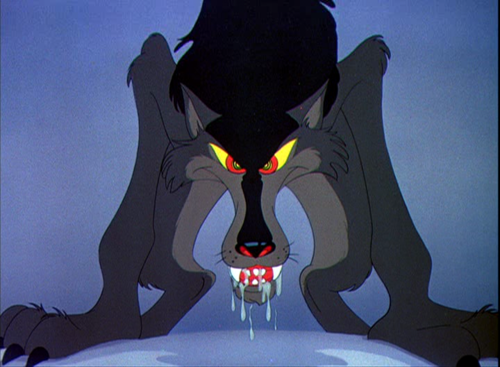 The only odd thing is the wolf seems to be out of another movie. 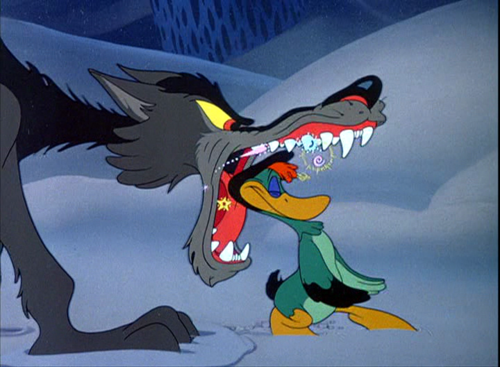 It is so ferocious and mean and all the other characters like Sonia the Duck and Peter are all so cutesy and sweet. I mean give us a fair fight Disney! But that said it is a good number. The Goodman Quartet plays while musical instruments dance across the screen. At one point they are boxing each other which is a strange choice. I think Mr Dali fan is putting his influence in once again! So here’s my little spiel about art. Art should mean something or tell some kind of a story, even if it tells different stories to different people. Or it should be beautiful or upsetting or stir some other kind of emotion. When it is just randomly putting things together it leaves the viewer confused and unless that is a reaction you want than it should be avoided. This is another strange set. Johnnie Fedora and Alice Bluebonnet are hats (yes hats) with eyes and a mouth that I guess isn’t visible to humans despite them kissing and starting fights. They are separated from each other and Johnnie is devastated and the piece is about him finding Alice and in the end they are both worn by horses which is strange. The whole thing is strange. I can feel for ducks, mice, parrots but hats… The Andrews Sisters sing the story which is kind of fun and nostalgic to hear. This is probably my favorite because it is strange but in a ‘I can’t believe that exists’ way. 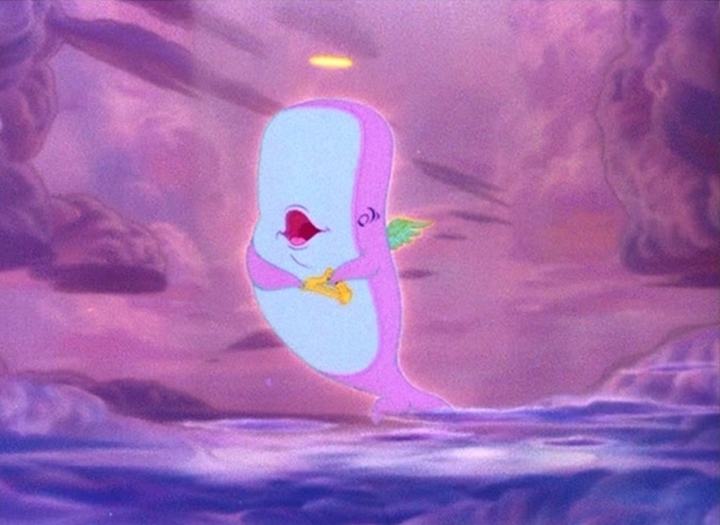 It is about a whale that sings opera. He is heard by fisherman and then eventually trapped and sings at the Met with at one point fire coming out of his mouth. Just having a whale talk in the middle of his body standing up looks so strange. I laugh whenever I see it. Why have it in the middle of his body like that? Whales have mouths at the top of their body. It looks like a big shoe singing. I find that such a baffling choice. Why kill him? Why not leave him singing his heart out to all the fans. Why end your cartoon with a message about how humanity isn’t used to miracles and silences them but in heaven everything is made better….’. I mean I guess they were in a time of war but wouldn’t it be better to teach kids about miracles and that humanity has it’s good sides? The whole episode is just so bizarre I kind of love it. So, that was a lot of work! 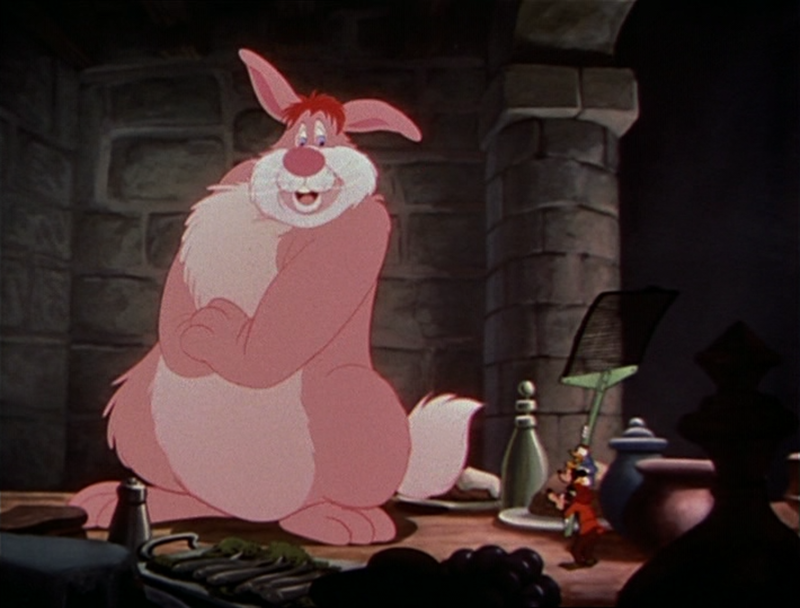 I hope you found it entertaining and go check out Make Mine Music. It is one of the oddest sets of entertainment I’ve ever viewed. I really don’t know what to say. Some of the pieces are forgettable, some are good and most of them are strange or have strange moments. So on that level I recommend it but if you are looking for normal, easy to absorb family entertainment this is definitely not the one to pick. 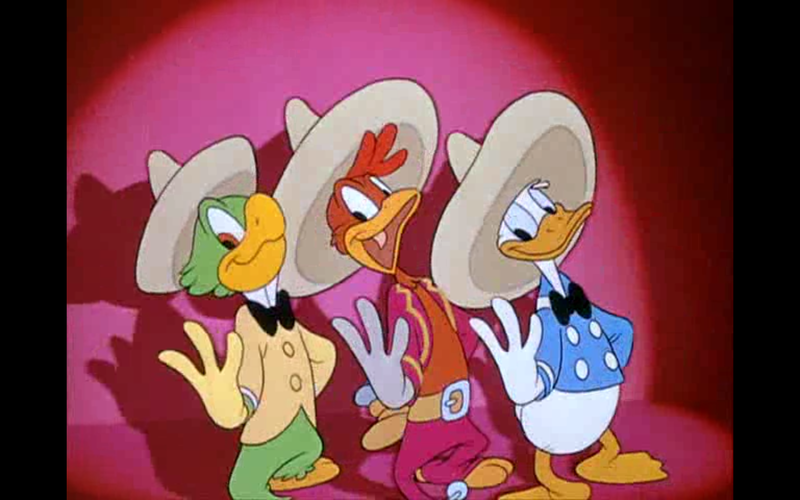 While we are in the latin mood let’s talk about the next feature film from Disney: The Three Caballeros. 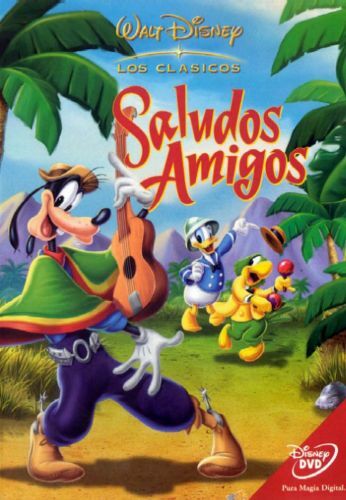 This is similar to Saludos Amigos and is more effective in some ways and less in others. 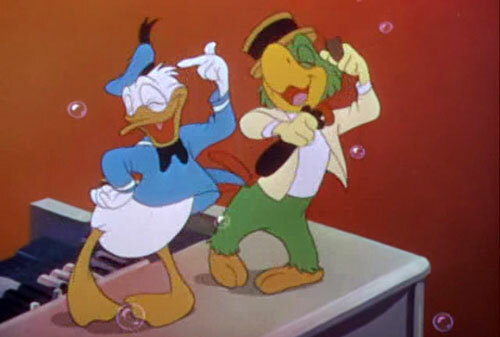 It has a similar history to Saludos Amigos and was part of the Goodwill tour but Walt and animators are not featured in Caballeros like they were in Saludos. Still, it does feel like a travelogue of Brazil and Mexico. At first it seems like the shorts are going to be good. 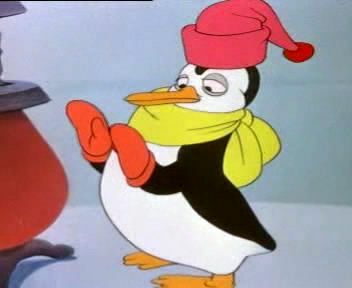 There is a cute piece on a penguin who dreams of an island paradise. And then one about a donkey that can fly and win sports races that is cute. Both of these are on the same level as the Pedro the plane short in Saludos Amigos. As you can see the animation in the song is quite good but it is just a little too much shouting for my taste. And I still can never understand what Jose is saying. Donald is hard enough but Jose is very difficult. After the song it becomes even stranger. 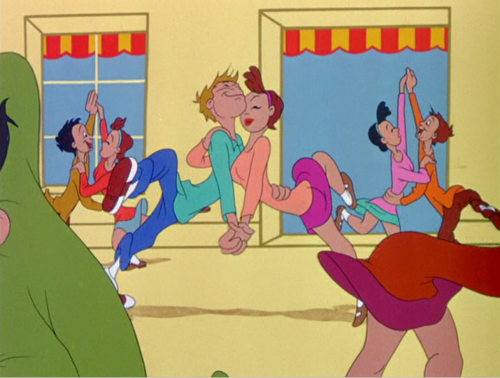 Evidently the merging of live film and animation had just been realized (I believe the same year Gene Kelly danced with Jerry from Tom and Jerry. No doubt Disney was excited about this potential and was eager to use it a lot! We spend a lot of the next 30 minutes watching people dance with the animation and listening to pretty good music but it has no story so it gets a little dull. 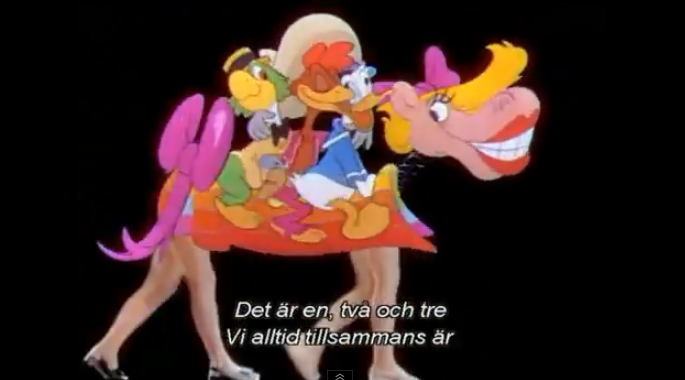 In one strange segment there are on a magic carpet with rows of human female legs as the horse. Very odd. they meet singers and dancers and learn about Brazil and Mexcio through them but it feels so outdated.So strange looking. Then the last third of the movie is literally Donald chasing human women around Buenos Aires which is strange on a lot of levels. 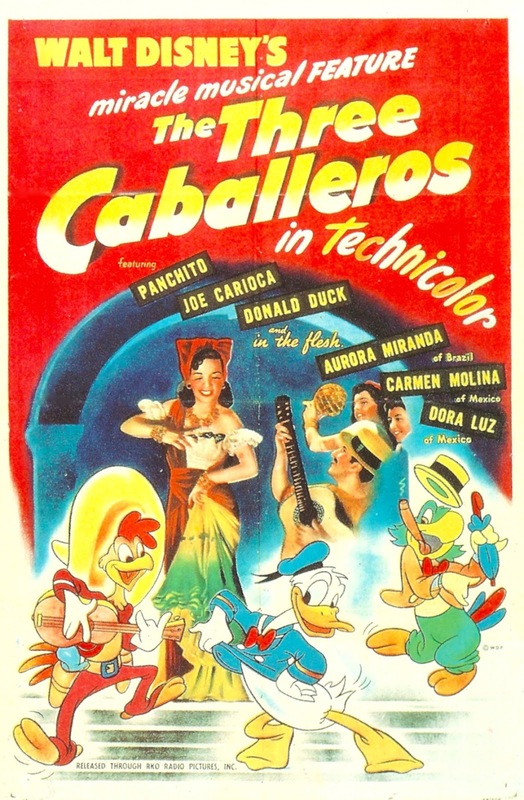 The animation is better in Three Cabellos than in Saludos Amigos but the novelty had warn off me and a lot of the dancing and skirt chasing was boring. They should have done 4 shorts like they did in Saludos but I think they were just so excited about the idea of animation/live action combining that they went a little nuts with it. It is 30 minutes longer than Saludos and it feels it. 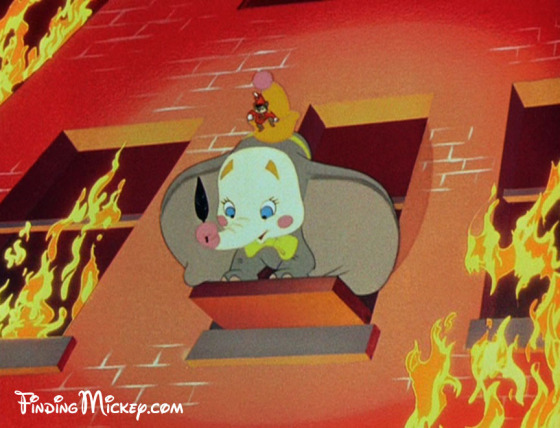 I still find it amazing that with this being a goodwill tour that Mickey never showed up in these films. I would think Walt would have pulled his alter ego out to help the cause. From what I read the box office was not as strong for this as Saludos, so probably why they moved away from these Latin films and on to English animated short mashups for the next 4 films. It’s harmless fluffy entertainment that would feel better as a blip before a feature film on the Disney channel. In those small doses it could be very charming but as a movie it is tough. The Donald chasing women gag isn’t really funny and all the music and dancing leading to nothing in the story gets a little dull. However, the animation is dizzingly fast and it is entertaining to see the beginning of animation and live action melding together. So, if you think a tour of animated South America sounds like your cup of tea, check it out. 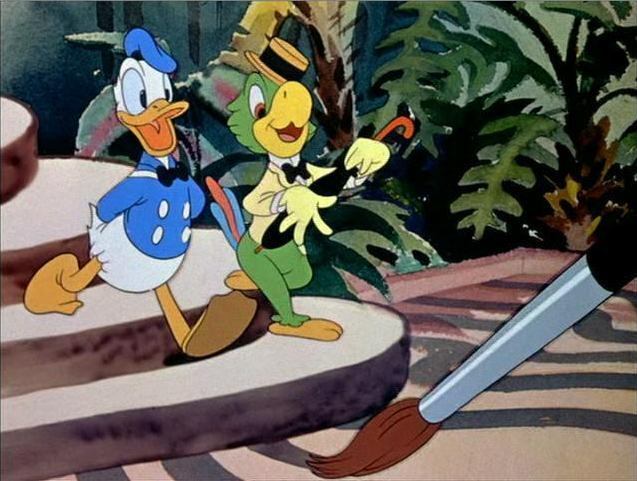 Now we are up to the feature films of animated shorts from Disney and Saludos Amigos is the first of two aimed at Latin American audiences. At the beginning of 1941 before Pearl Harbor and US entry into the war Disney was asked by the state department to do a goodwill tour of South America. Saludos Amigos and The Three Caballeros were a result of that effort. The state department was worried the Latin American countries might be sympathetic to the Nazi’s so it was crucial to do something. While getting the needed grant from the government to make these shorts Disney was also changing strategy. 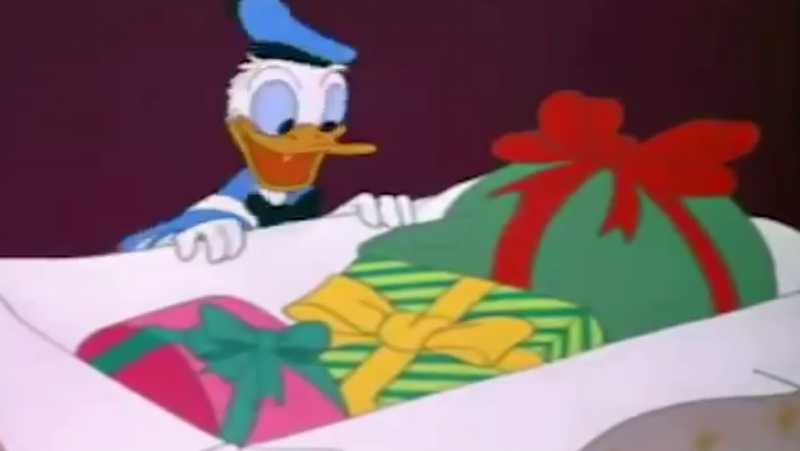 Instead of the ambitious artpieces of their first 5 films they went with bankable stars like Donald and Goofy and shorts that could be easily put alongside other movies in a theater. Gone was the Fantasound and other expensive theater strategies. This was make something fun and charming using the characters everyone loves. Nothing wrong with that but it has made the movies from 1943-1950 kind of forgettable. 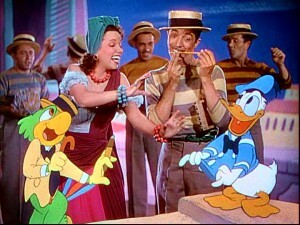 Saludos premiered in August 1942 in Brazil and in 1943 in the US. Part of the reason Disney agreed to these films is they were part of a federal grant and the loss of the European market in the war had been a huge blow. Combined with a strike that year they needed the funds. 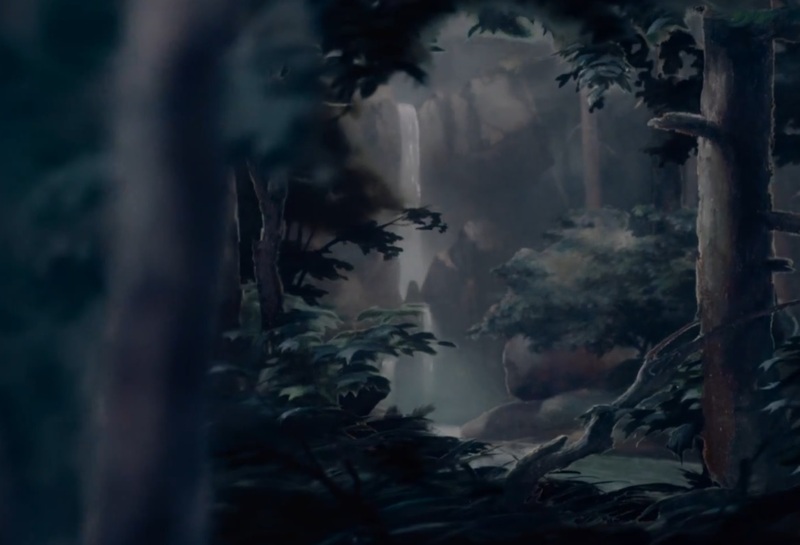 The movie is kind of like a travelogue of Latin America sometimes in live action and then 4 animated sets. To a modern day audience it seems out of date and corny but at the time it was very popular. Film historian Alfred Charles Richard Jr. has commented that Saludo Amigos “did more to cement a community of interest between peoples of the Americas in a few months than the State Department had in fifty years”. 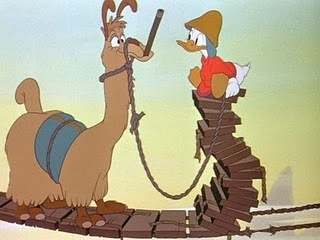 Donald dealing with a llama! Pedro- A story about a small plane in Santiago who must take the mail when Papa Plane and Mama Plane can’t do it. Pretty much a Rudolph storyline. 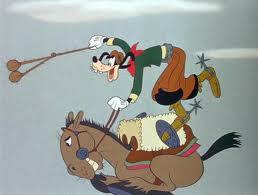 El Gaucho Goofy- Set in Argentina Goofy must learn to be an Argentine Cowboy- or a gaucho. This is very similar to the other Goofy ‘how to’ videos such as the one on photography. Aquarela do Brasil- Set in Rio this short is as if the characters and ideas for the story are being drawn by an artist and those paintings come alive. We also get introduced to Jose Oliveira who is a Portuguese parrot. He is a cool looking character but tough to understand sometimes. The soundtrack sold well and is fun and includes samba and other latin inspired dances. I couldn’t find the box office results but from what I’ve read it sounds like it did pretty well. So how does it hold up? Not very well I’m afraid. It’s harmless and kind of fun to see what propaganda films looked like in the 40s. The music is engaging and some of the cultural attractions are neat to see (some of them also seem way outdated). The animated sets are cute but nothing mind blowing. Unlike previous Disney products these are not art but sprightly entertainment. And it’s only 41 minutes so hard to be too tough on it but it didn’t feel like a feature film. 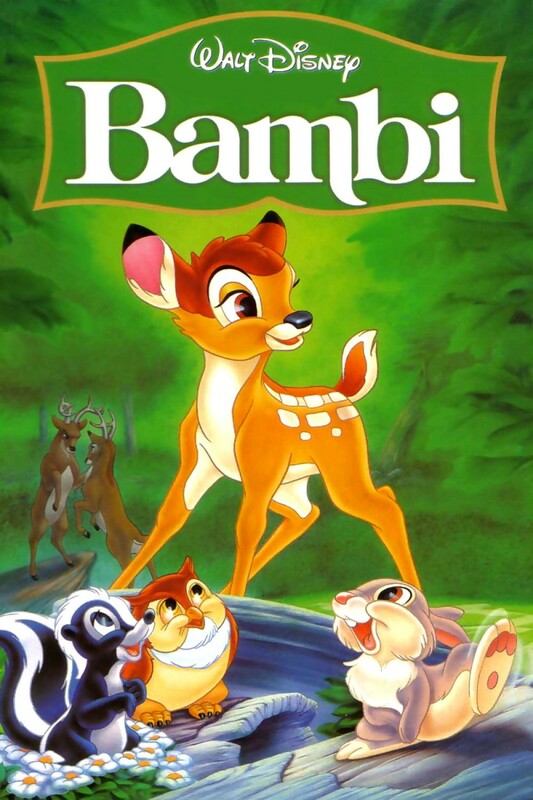 However, it’s on Disneys list of animated classics so I watched it. It’s not horrible just not one of my favorites. Incidentally it seems you could write an interesting screenplay about this goodwill tour Walt and the animators took, these movies, the enthusiastic response and the dealings with the state department. Just a hunch. I am a little surprised they didn’t use Mickey since it was a goodwill tour. Still always enjoy seeing Donald and Goofy. The animated segments hold up better than the live action which feel dated partly from the trappings of 40’s technology and dress (and film). The whole project kind of feels like an episode of Sesame Street with humans and animation instead of puppets. Kids will enjoy each of the animated sections especially if you come from a Latino background and the story of the Goodwill mission is interesting. The war would have been much different if South and Central America had gone with the Nazis. Overall Grade C Generic but pleasant enough. In modern movies typically we see a hit followed by a million imitators. Not the case with Disney. 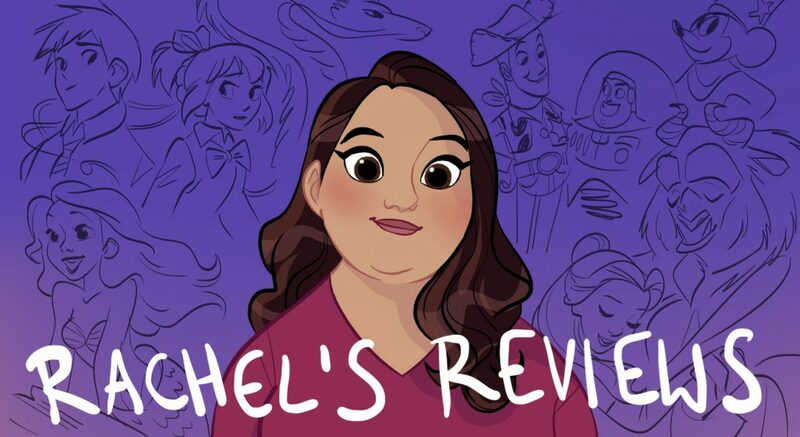 Even in later, more commercial years they followed Little Mermaid and Beauty and the Beast with the different feels of Aladdin and Lion King. However, this was never more true than in the early years. 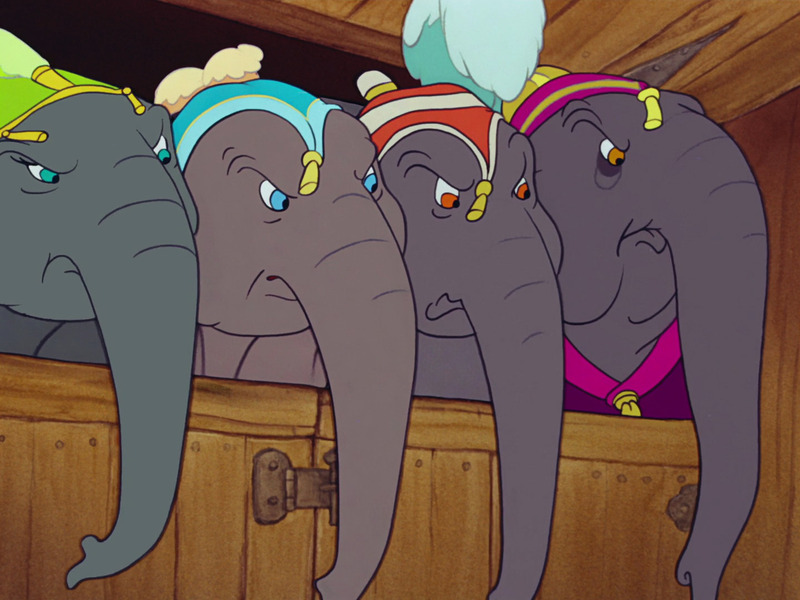 A mammoth hit of Snow White was followed by 4 films that couldn’t be more different- Pinocchio, Fantasia, Dumbo and Bambi. 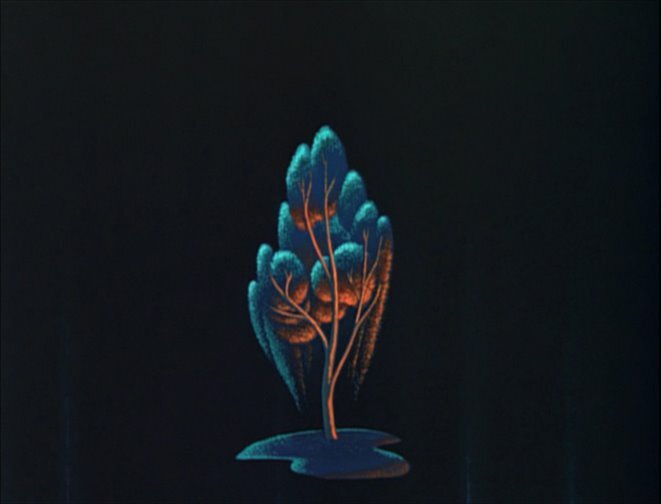 Fantasia was the 3rd animated feature film by Walt Disney Studios and it is a bold undertaking to be sure. Originally Walt was worried the character of Mickey was going to be forgotten by the public and even the studio. As his master creation Walt didn’t want this to happen and had developed an idea for the Sorcerers Apprentice. Music had been written and the concept had been drawn. 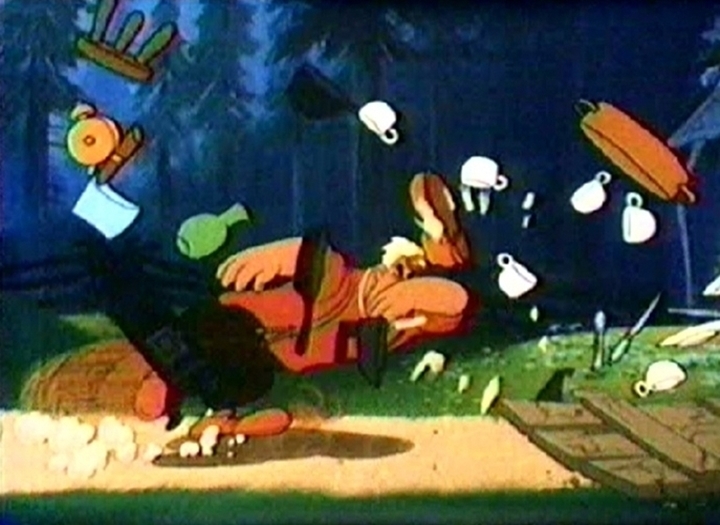 Unfortunately Disney was left with only a short, so he got the idea to create a series of shorts that would build off of his Silly Symphonies series- pairing animation with classical music. The music was recorded by the Philadelphia Orchestra which was led by famous conductor Leopold Stokowski. 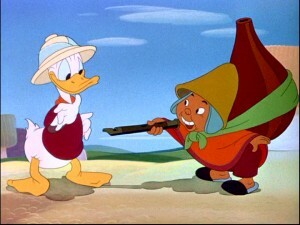 Evidently he and Disney had met in a restaurant and Walt mentioned his idea of the Sorcerers Apprentice. 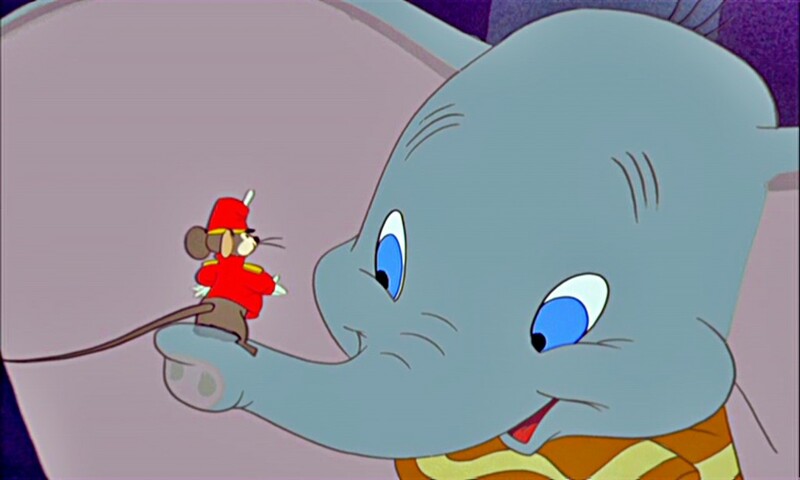 Leopold told Walt Disney he ‘liked the music’ and would be willing to conduct the piece at no cost. Then Disney later ran into Stokowski on a train and they shared ideas for the short. Disney told him later he was ‘all steamed up over the idea of Stokowski working with us’ and that it would ‘lead to a new style of motion picture presentation’. So work on the Sorcerers Apprentice began in 1937 but by January 1938 the cost had climbed to 125,000 so Disney realized a short could never make that back. A feature film of a series of shorts was discussed. 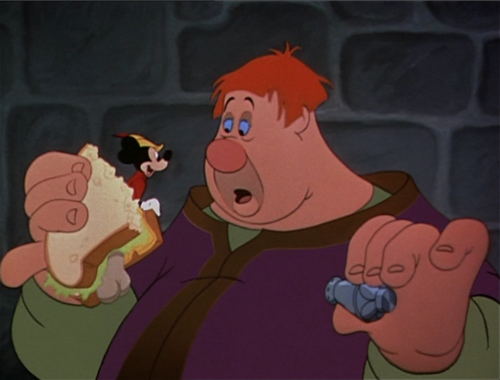 Roy Disney wanted to keep the budget low because of the ‘experimental and unprecedented nature’ of the production. 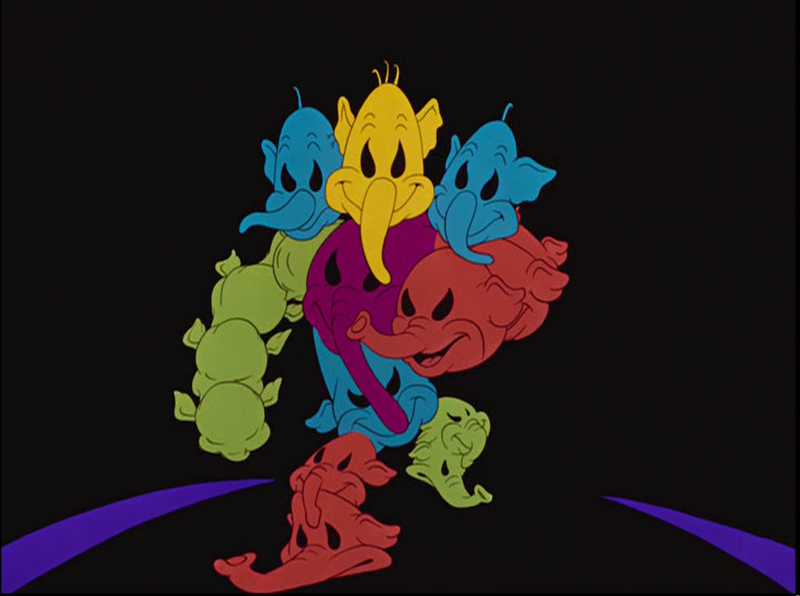 Each of the shorts in Fantasia involved different techniques. In Toccata we see an homage to abstract art. In the Nutcracker Suite professional ballet dancers were brought in, filmed and then sketched. In the Pastoral Symphony we see almost a watercolor effect. 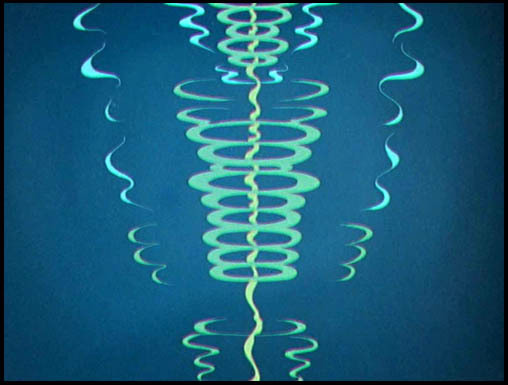 The music was recorded in 1939 and took 42 days, 33 microphones, and 483,000 feet of film. 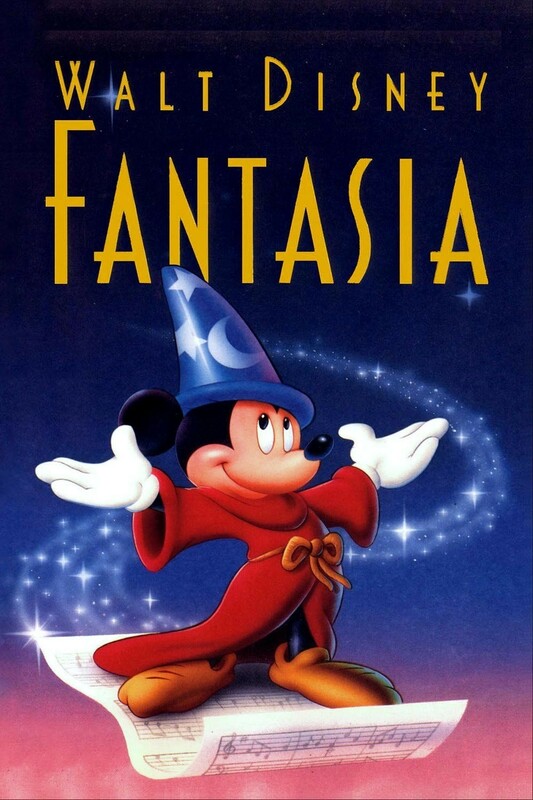 Fantasia was also released in Fantasound which was developed by the engineers at Disney and RCA which had 2 projectors rolling- 1 with the sound, another with the film. Eventually it was released to the general public with 20 minutes removed and then 45 minutes taken off. It was then released again in theaters 9 more times, finally making money in 1969 release. In that release 4 scenes from the Pastoral Symphony showing black pegasus waiting on a white one were deemed racially insensitive and removed. In 1982 a new soundtrack was recorded and in 1990 the live action scenes and original uncut film was released. I saw Fantasia in 1990 and it grossed $25 million. It’s neat but probably not my favorite as there is no story at all. This is my personal favorite probably because it is the music I am the most familiar with. This shows us all the seasons through the eyes of fairies waking the forest up. This is probably the section that is enjoyed by children the most as we see lazy Mickey take the wizards hat so the brooms will get the water from the well. All bedlam breaks out until the Wizard returns. In this piece we see the galaxy, creation of the world, the planets first creatures, and the life and death of the dinosaurs. 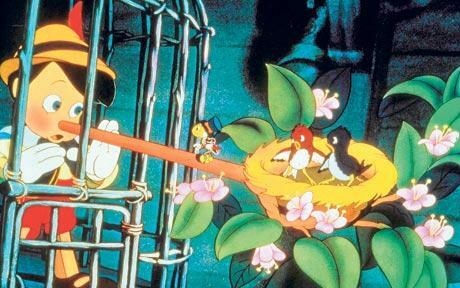 Yes there is an intermission in a Disney film but you kind of need it to absorb all of the beautiful images and music. We do get one brief segment called Meet the Soundtrack where different notes make visual vibrations. 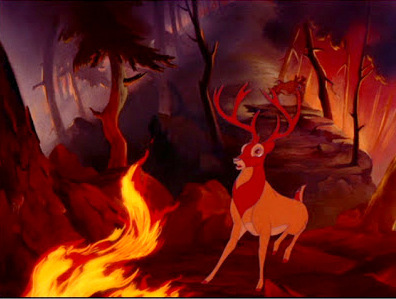 I would never have thought to put Greek mythology with Beethoven but Disney does and it is beautiful. We start with introductions to the centaurs, cupids, fauns, pegasus and other figures. They are falling in love and having a festival for Bacchus, the God of Wine. However, Zeuss decides to rain on the parade and sends a storm and throws lightning at them. I really enjoyed watching the Pastoral Symphony. My favorite image was the depiction of night as a woman with a giant cloak covering the sky. Beautiful. 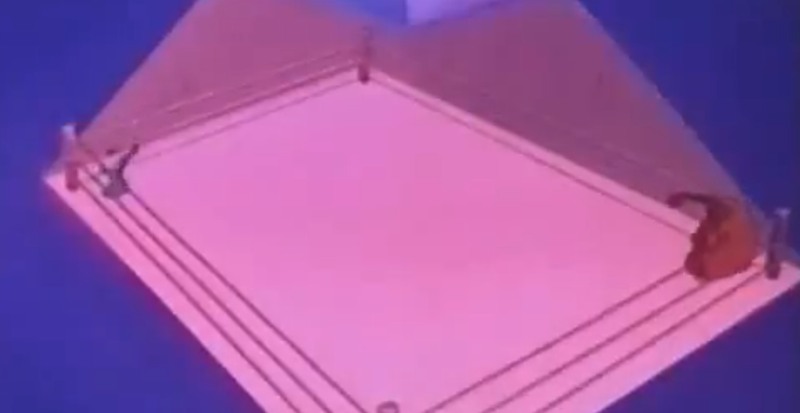 Next to Sorcerer’s Apprentice this is probably the most famous segment. It is a ballet with characters representing all parts of the day. Ostriches are morning, Hippos are afternoon, Elephants are evening and Alligators are night. This is the routine that will probably entertain small children the most with the comical hippos and strange looking ostriches dancing. 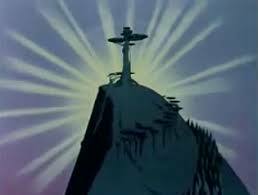 The last segment continues Disney’s early trend of embracing darker themes and messages with bald mountain being the home of Satan. We get the Devil and all his bloody minions. But then we see a light and it gets wider until we see a tree, a forest and a band of people holding lights. It’s a beautiful contrast. It should be clear from all the work I put into this post I think Fantasia is pretty spectacular. And yet, I remember seeing it in 1990 and as a 9 year old I was kind of bored. So, is it an animated movie for adults only? Maybe but I think there is a strategy which could make this work for kids and adults who perhaps don’t love classical music and art as much as lovers of this film do. I’ve noticed with children enjoyment of any activity comes down to timing. Fantasia is not the movie to play when the kids are driving you nuts and you need 2 hours of free time. It is not the film that will entertain kids. It is a film that can educate kids (and adults) and should be treated like other educational experiences. Find a time when you can sit down and explain what is going to happen the way you might before going to an art museum or a play. Children under 5 are probably not going to enjoy it even then but older kids should be able to understand the difference between art and entertainment. The film is split into segments so dividing it up may also be a good way to go. There is no reason why all 2 hours must be seen at once. You could learn about each composer and then watch their segment and I bet everyone would enjoy that. 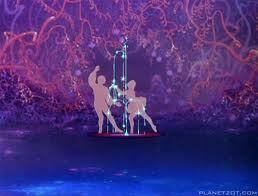 I look at Fantasia kind of the way I saw Tree of Life. They are both art pieces more than movies. In a world of cookie cutter films how great to see something that transcends entertainment. Something that makes you want to be creative- and Fantasia will inspire you in both your ears and eyes. I admire Walt Disney so much for making such bold films. Fantasia was such a risk and you rarely see such risks. It can be a little slow at times but I still think it is a masterpiece. I hadn’t seen it in a long time and feel inspired after watching it today. I bet you will too. 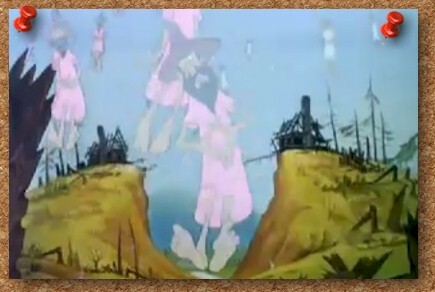 So now we get to a terrifying moment of my childhood- watching Pinocchio. And on a rewatch I have to say I was perfectly valid in being scared! It’s kind of a nutty movie but in a way I now find quite brilliant. It was certainly a bold undertaking. All the post- Snow White movies were very bold. I think we have an idea of the 30’s- 50’s as being squeaky clean and polished but that’s definitely not the case with Disney. 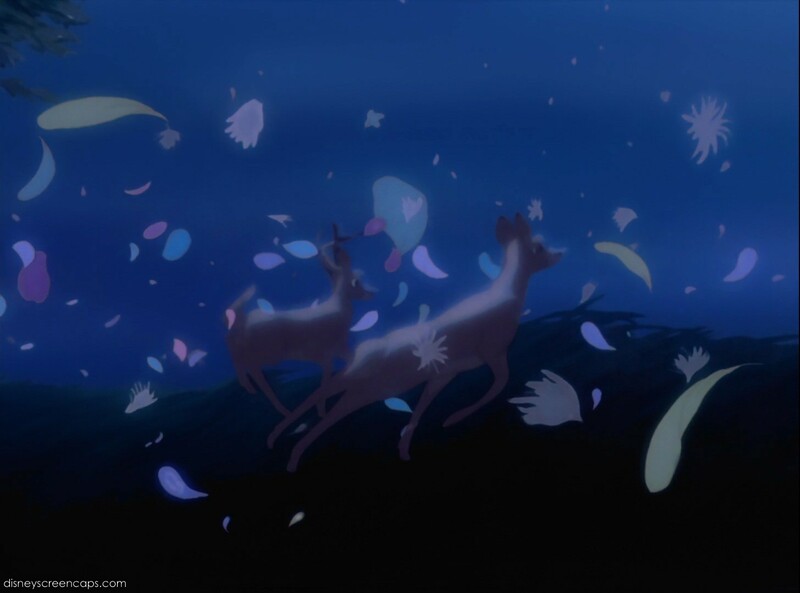 Snow White, Bambi and Pinocchio all have darker themes and moments of characters dieing. 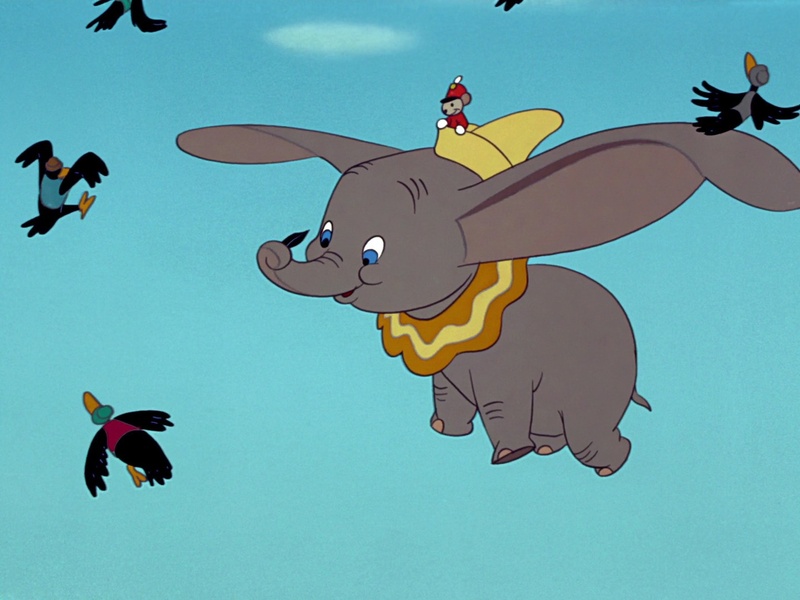 Dumbo has a baby separated from his mother, which is quite devastating. To be clear, the darkness is not necessarily a bad thing because it is always paired with lightness and humor. Still I don’t think Disney takes as many risks these days. Pinocchio is based on Carlo Collodi’s 1883 novel. 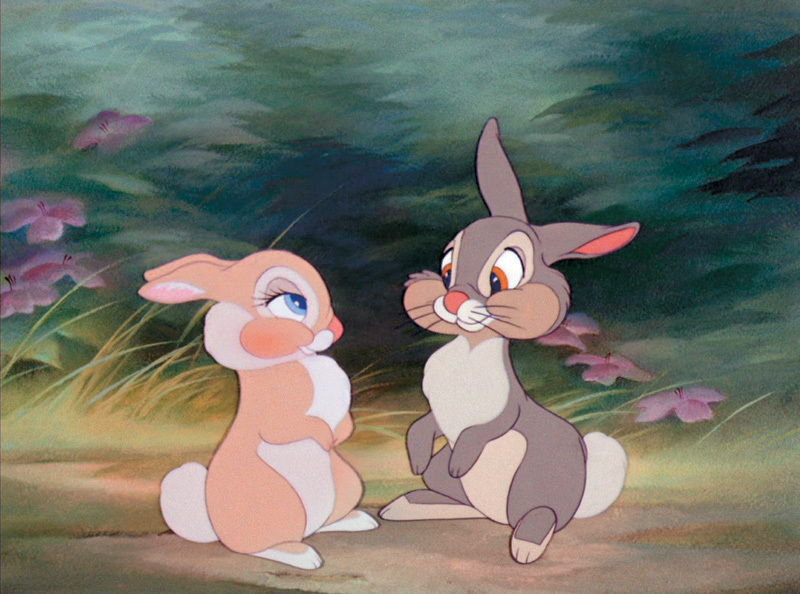 It was purchased by an animator and given to Walt Disney who immediately loved it. The story of the novel is changed drastically (In the book evidently Pinocchio is cold, rude, and ungrateful). They also changed Pinocchio from an all wood design to give it more of a fluid feel. 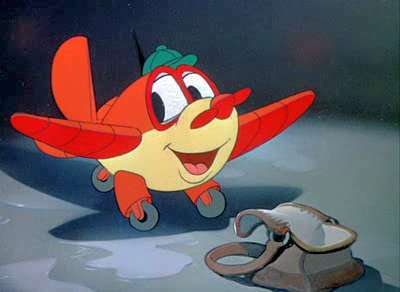 Animators used the puppet Charlie McCarthey as inspiration for Pinocchio’s appearance. 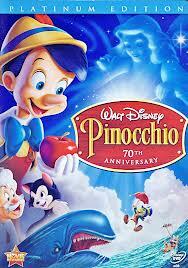 The story of Pinocchio is what is called a ‘morality tale’. Morality plays were popular in the Victorian era and usually involved a character having to make choices and fight off temptation. ( fables, greek myths, etc were popular choices). These stories also typically had biblical illusions. Masonry and other groups also have morality tales as part of their rituals. She also tells Pinocchio that in order to turn into a real boy he must learn to be ‘brave, truthful, and unselfish’ so each of the episodes of the movie teach Pinocchio (and the viewers) these lessons. The Blue Fairy gives Pinocchio some help in Jiminy Cricket who is his conscience and serves as a semi-narrator to the movie. Evidently Jiminy was added to the story in 1938 because Walt felt it needed to be softened and I think he was right. So off Pinocchio goes to school and he meets the first of many villains, Honest Fox and his cat friend Gideon. The world Pinocchio operates in is very strange. 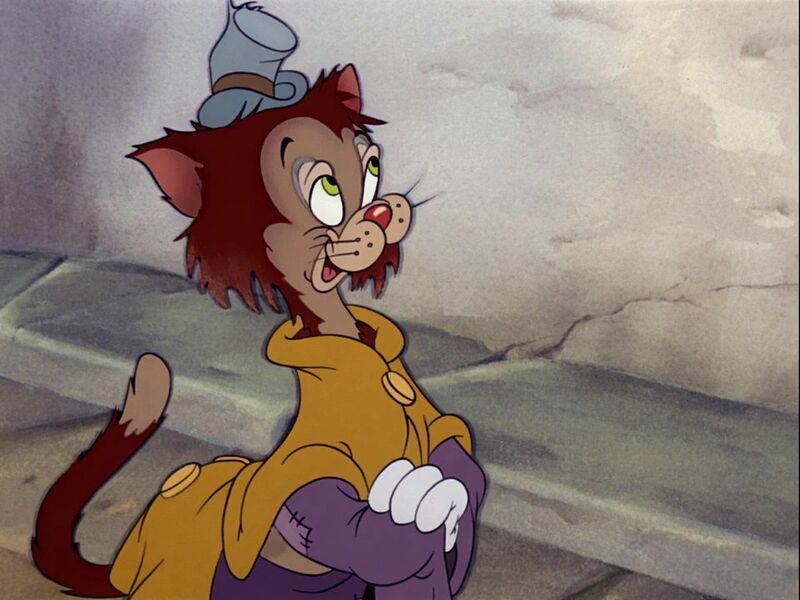 For instance, we have Gideon the cat anthropomorphized and yet Gepetto also has a cat named Figero that is a normal cat. There is also an acceptance of magic which is interesting but it is used at some points and then other times they have to push through. 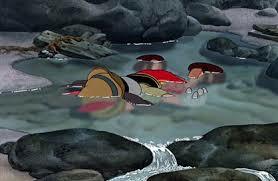 For instance, they are able to travel under water for large periods of time and yet another scene shows Pinocchio as having drowned. Unlike most Disney films Pinocchio does not have one evil villain but a series of corrupt people trying to lead Pinocchio astray. It is almost as if evil itself and sin is the villain. Honest Fox then sells Pinocchio to the gypsy Stramboli who wants him in his marionette show. At first Pinocchio is dazzled by the bright lights and attention. Then it turns out Stramboli imprisons Pinocchio so he won’t run away. 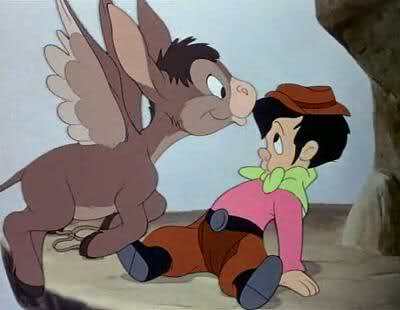 The Blue Fairy comes to rescue him but not before Pinocchio tries to fudge how he got there. This causes his nose to grow. No wonder I was terrified! 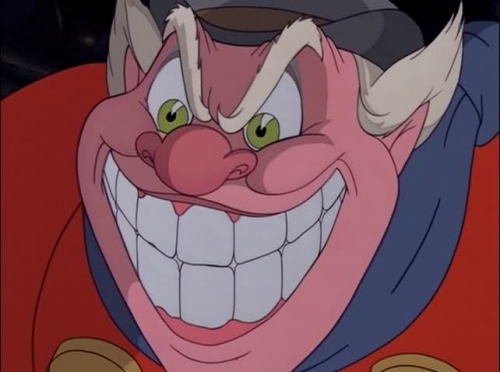 Lampwick introduces Pinochio to many evils. Pleasure Island has pool, alcohol, cigars, mayhem, and lots of children out of control. It turns out The Coachman is drawing all these children to Pleasure Island in order to turn them into donkeys for the salt mills. This is absolutely terrifying idea. There are even donkeys who are half-way turned so they are still talking and The Coachman throws them to the side to ‘deal with them later’… Yikes! Is this Disney or a horror movie! So are we supposed to assume that all the animals are secretly naughty children? What’s amazing is that Pleasure Island is never really resolved. Pinocchio escapes but that is it. I guess the hundreds of children we see playing early on are donkeys and The Coachman keeps with his scheme. Who knew mines needed so many donkeys? From Pleasure Island Pinocchio has learned to not be selfish. To think of Jiminy, his father and others and not just doing what is fun. Jiminy and Pinocchio get back home but Geppetto is gone and the Blue Fairy gives them a clue that he is in the belly of the whale looking for Pinocchio. It’s kind of funny that the Blue Fairy doesn’t help them any more but I guess Pinocchio wouldn’t have learned to be brave. 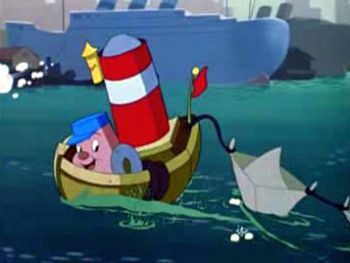 So off they go to find Geppetto and defeat the final villain Monstro, the whale. There is a dazzling scene under the water. 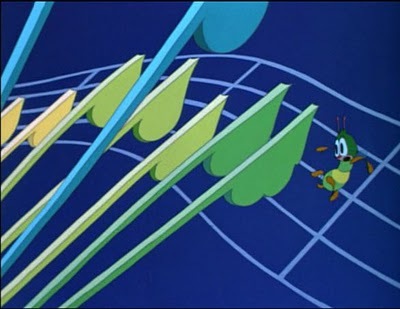 Pinnochio was a pioneer in animation because Disney developed a technique for layering animation on top of animated backgrounds. Look at how the bubbles and waves are layered around the characters in this scene. Eventually all are saved and home but Geppetto is grieving because he thinks Pinocchio is dead. 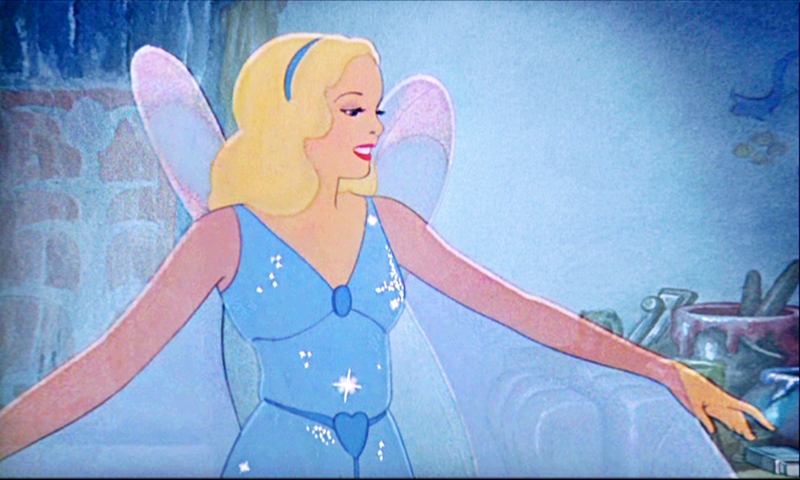 The Blue Fairy comes and turns him into a real boy because he has learned what he needed to know. 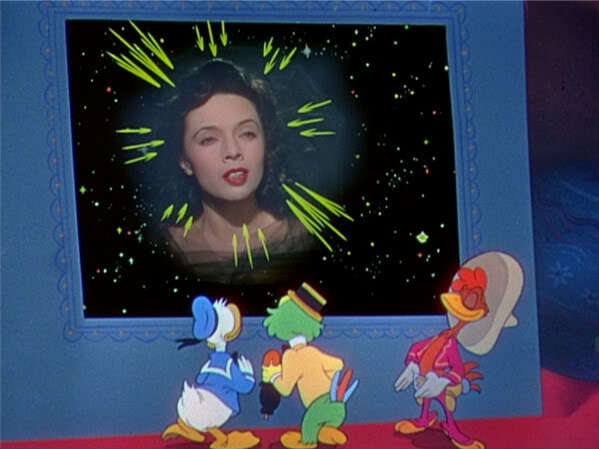 We also get a reprisal of what became the official anthem of Disney- When You Wish Upon a Star. It is also why the Disney logo is blue for the Blue Fairy. I know that was a lot of detail but it’s such an odd movie I couldn’t think of any other way to describe it. As an adult there is lots to like about Pinocchio. It is creative and different. The artistry is often dark and beautiful. It teaches good lessons and has wonderful music. On the other hand, it can be heavy-handed in the delivery of those morals, which can be intense for children and annoying for adults. Modern storytelling has learned to be a bit more nuanced in its messaging. It also creates a world that doesn’t really make any sense. It is almost like an anime world of today like in Sprited Away where some animals behave one way, others another. Sometimes people are magic, sometimes they aren’t. The Pleasure Island scene is pretty scary. I remember being terrified by it. 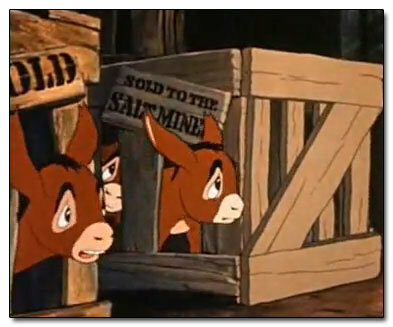 Also it is unsettling to not know what is going to happen to all the Donkey children. Stramboli is scary and so is Monstro the whale. But sometimes kids like to be scared. I don’t’ think it is so much that it will harm or scar a child, so it’s appropriateness depends on the child. The music by Harline and Washington is wonderful. 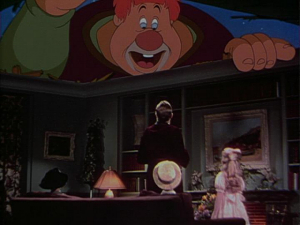 In the first scene Geppetto plays a music box and you can hear that influence throughout all the songs. Some express concern about When You Wish Upon a Star because dreams do not always come true but I don’t think encouraging children to dream is a bad thing. They have plenty of time to learn the harsher realities (plus many are presented within the movie) so that doesn’t bother me. 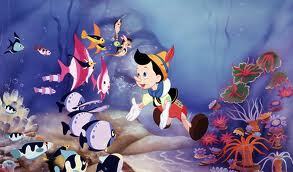 It is interesting that Pinocchio only has one female character in the story- the Blue Fairy. In Snow White we have 7 male dwarfs, a prince and an evil queen. 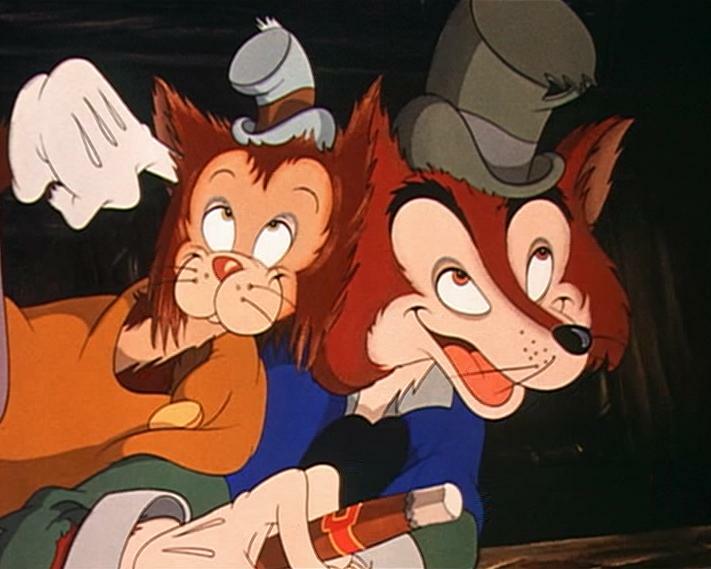 In Pinocchio Geppetto, Jiminy, Honest Fox, Stramboli, The Coachman, Lampwick. I don’t know if that will affect a girls enjoyment of the movie but it is interesting. Pinocchio is visually gorgeous with good, if heavy-handed moral teachings. It can be scary for kids and has a grim overall in feel. I appreciate it but I can’t give it my highest rating because of how I know it affected me as a child.